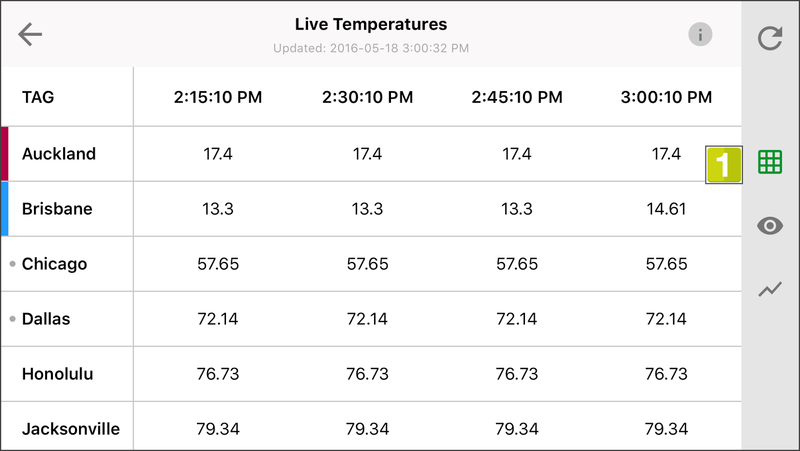 Wonderware SmartGlance May 2016 Update | Full Landscape support, Native Login, Live Chat. 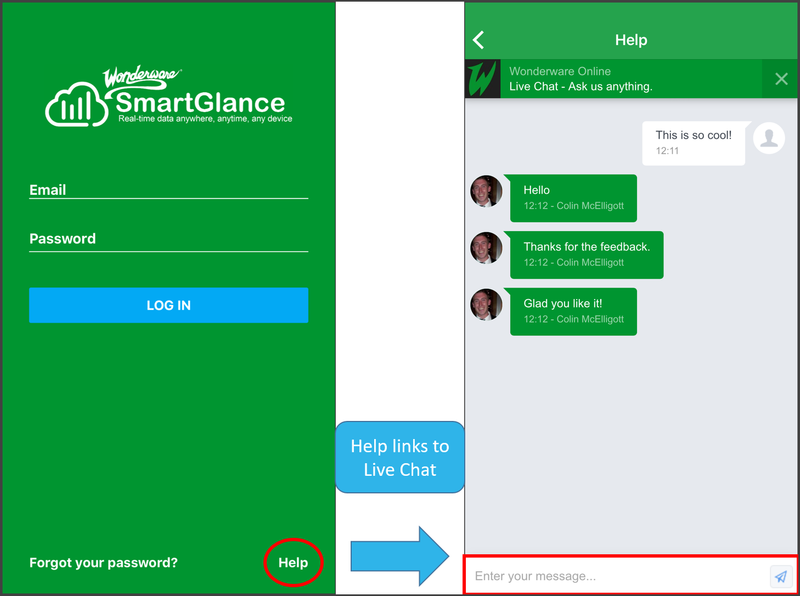 We've recently updated the Wonderware SmartGlance apps for iPhone and iPad with a significant improvement to using SmartGlance in landscape mode, added a native log in screen and made getting in touch with us super easy via live chat. You have automatic updates turned on - right? 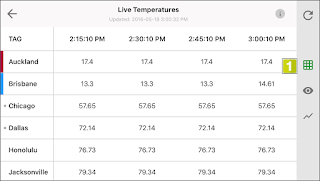 Customers can now easily switch between a quick one-handed view in portrait mode to effortlessly navigate through their Key Performance Indicators or chose to literally deep dive throughout the entire app experience exclusively in landscape mode for the best and widest viewing experience across larger phones (like an iPhone 6 Plus) and tablets (for example, iPad Pro, Air and mini). New navigational panel in landscape mode for mobile phones. Take a look at the screenshot here. Where the #1 icon is, this is the Grid view that you would be otherwise familiar with in portrait mode. Here in this screenshot, you can see that we are in the "QuickView". 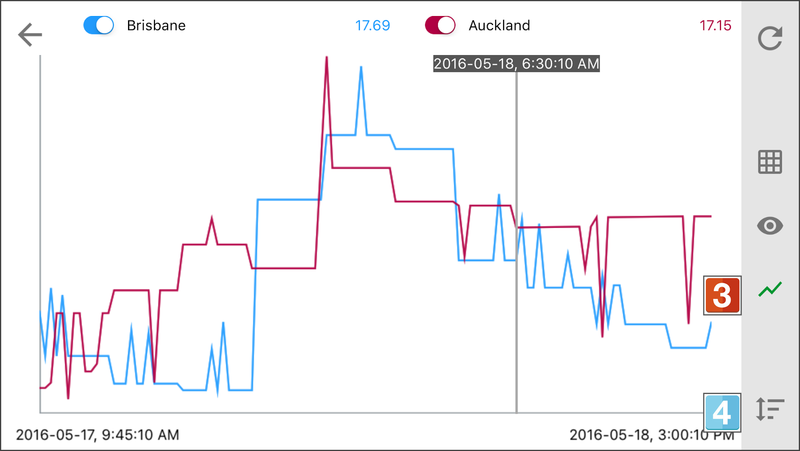 Top tip: Did you know that even when you don't have any tags selected, you can tap on any spark link graph to jump to the Chart view? 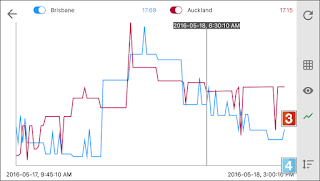 Did you also know that even if you select multiple tags, you can still tap on any spark line graph to jump to chart view? 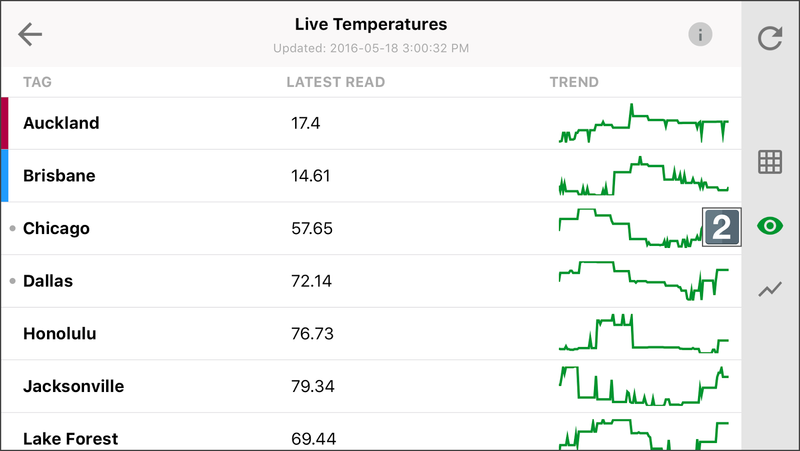 At point #3, and in the screenshot shown here, we are highlighting the Chart view in landscape mode. A little tweak that we did here is give the scaling icon (denoted by #4) a little graphical face lift. 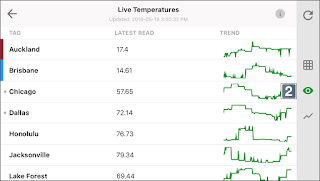 Tapping this button toggles the Y-axis scaling between plotting two or more tags on either a common scale or having each tag plotted on their own respective scale all plotted on the same canvas. We also gave the initial log in screen a cleaner, tighter look by making it a native in-app screen presentation including built-in live chat. Yes, the same live chat that is available on https://online.wonderware.com is now also available on the log in screen as well. 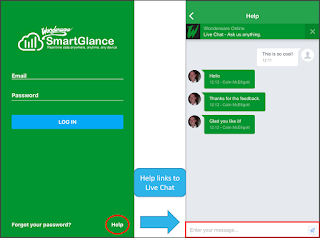 If you have any questions about the Wonderware SmartGlance, engage with us directly through the chat. New native log in screen with Live Chat built right in.